“Let’s go Cowboys!” yell the Rowdy Cowhands of McMullen ISD. For the past four years, McMullen County ISD has had the Rowdy Cowhands organization for students in the third through sixth grades. 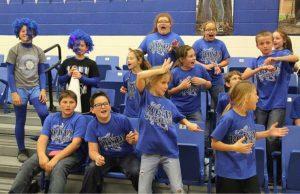 By joining, kids get into basketball games for free and come together to cheer on the team. They can be seen in the stands at home basketball games, wearing their Rowdy Cowhands T-shirts and yelling chants with the cheerleaders. The name “Rowdy Cowhands” comes from the high school students’ nickname for the elementary “cowhands”, since their mascot is the Cowboy. “The nickname just stuck with the kids, so we called the group the Rowdy Cowhands,” said sponsor, Rebecca McCarthy. Thanks to the program, more elementary kids attend the games, show their school support and, most importantly, have fun! Be sure to check out the Rowdy Cowhands this basketball season in McMullen County!